I leave for a week and come back to find that it’s the end of August. End of August? It has been many many years since I was on a school schedule, but I can’t help feeling like fall starts September 1st. Our vacation was a little rough. On the whole, my family is very healthy. My brother Alex is prone to needing surgery (seriously, the guy has had over 10 surgeries and is only 35), but other than that, we are very rarely sick. For some reason, Sun Valley is the place where our immune systems fail us. Monday afternoon my brother Michael started to feel unwell and soon after I felt rotten too. I’ll spare you all the details but 6 of 11 of us came down with stomach flu and my brother and nephew ended up in the hospital needing fluids. Of my immediate family, only my 2 year old was spared which is a good thing in retrospect. By the time we were all feeling back to normal, we only had two days left but we tried to make the most of it. My anniversary fell on the worst night of the plague but Randy and I were able to celebrate 7 years together a few nights later at one of our favorite spots. He took the boys to Redfish Lake – an incomparably beautiful spot – but I was unable to make it. I mostly just hung out. I did get my baked potato and it was huge and delicious. This is the time of year when I start to feel summer pressure. I know fall is coming and yet there are so many light and summery recipes I didn’t get to. I must use corn and nectarines everyday…or so I feel. 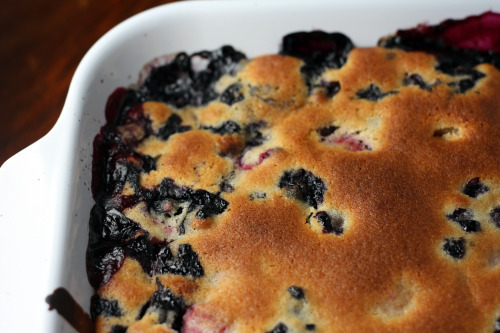 Before the nights get too cool and before the berries disappear from the markets, make this Mixed Berry Spoon Cake. You can vary the fruit, it’s easy, it feeds a crowd, and you can put your summer fruit guilt to rest. 1. Make the filling. In a bowl, toss the berries with the sugar and the cornstarch and let stand for 10 minutes. 2. Meanwhile make the batter: Preheat the oven to 375°F. In a medium bowl, whisk the flour with the sugar, lemon zest, baking powder, and salt. In a small bowl, whisk the eggs with the milk and vanilla. Whisk the liquid into the dry ingredients until even moistened, then whisk in the melted butter until smooth. 3. Spread the filling in a 9-by-13-inch baking dish. Spoon the batter on top, leaving small gaps. Bake in the center of the oven for 1 hour, until the fruit is bubbling and a toothpick inserted into the topping comes out clean. Let cool for 1 hour before serving. This last bit of summer is busy around here. We went to Lopez Island for a couple of days earlier this week and tomorrow we head to Sun Valley for a week with my family. After Randy’s horrendous travel schedule this summer, I am glad we can wind down a bit as we head into fall. I am very much looking forward to this trip. We started going to Sun Valley when I was 11 years old – to ski in the winter and to enjoy all a mountain resort with incredible weather has to offer in the summer. It is one of my favorite places on Earth. We will be staying right in the delightful town of Ketchum and, because of the ages of our children, will most likely take it pretty easy. Walks to the park, maybe a chair lift ride up the mountain, a swim here and there, a visit to a gorgeous lake, and lots of eating. I must have an Idaho baked potato. If you haven’t had the pleasure, there is a reason Idaho license plates say “Famous Potatoes”. I had hoped to prepare a couple of posts to publish while I was gone, but it’s just not to be. Like I did the last time I skipped town, I want to recommend some awesome sites that I am just loving these days. I love Gwen at Pen and Fork for her innovative and downright delicious looking food. I love Sala at Veggie Belly for her incredible vegetarian food, amazing photography, and for being one of the kindest people I have encountered in the blog world. I love Sara at Sprouted Kitchen for the artful photography and healthy but nourishing food. I love Tara at Seven Spoons for her perfectly worded prose and delightful recipes (and also for being a mom of two young boys). I love Marta at Just Call Me Marta for her wise words and incredibly positive approach to life and it’s challenges. And I love Sarah at In Praise of Leftovers because she is a good reminder that we all could do more, not only with the food that we already have in our kitchens, but also for the community. There are many more – I could probably make this list once a week and add new sites each time. Enjoy your reading and I’ll be back with more Treats in a week. Vegetarian readers – avert your eyes. For the rest of you – yes, those are shrimp. And yes I made them. I also made mini crab cakes that I would have taken a picture of if they had not been devoured by people sneaking into the kitchen before I could even get them to the table. Here is the thing. We invited about 65 people to the party. Because it’s summer and lots of people are out of town, somewhere between 45 and 50 showed up. Five of those people are veg, myself included. I know our meat-eating friends like my food – I just felt it was a lot of ask of everyone to make everything veg. And because I am not, nor have I ever been a soap-box-standing vegetarian, I decided to use some “protein” that wasn’t tofu. I had never made shrimp but was assured on Twitter that it was easy and even got a few awesome recommendations of how to serve them. In the end, I decided to go with a recipe from Mr. John Ash, Napa cuisine pioneer and author of one of my favorite cookbooks that isn’t vegetarian -From the Earth to the Table. 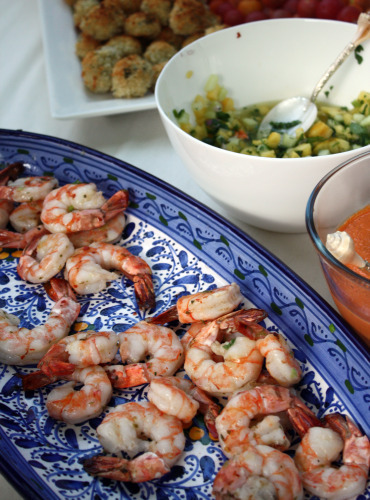 The shrimp were marinated for two hours in a mixture of olive oil, white wine, green onions, and herbs. I decided to make two sauces, also from Mr. Ash. One was a red pepper aioli and the other a fruit salsa and I think both were well received. I tripled this recipe and then my husband went out and bought another two pounds. There was not a single shrimp left. I bought one of those grill pans so we could grill many of them at a time, but you could just use skewers. I used peeled de-veined shrimp for obvious reasons, but Ash says you can grill them with the shell on. Whisk together the olive oil, garlic, green onion, oregano, salt, pepper flakes, and wine and marinate the shrimp for a maximum of 2 hours, covered, in the refrigerator. Grill or broil the shrimp quickly, about 1 to 2 minutes per side, until they just turn pink. Be careful not to overcook. Shrimp should remain slightly transparent int he middle. In a medium bowl, carefully stir together the melon, pineapple, chile, and red onion. In a small bowl, whisk together the olive oil, lime juice, and honey and pour over the fruit mixture. Gently stir in the chopped cilantro. Season to taste with salt and pepper. This recipe seemed to make a lot more aioli than we needed for the shrimp but it’s great as a dip for vegetables and for roasted potatoes. It is also delicious as a sandwich spread. Add the egg yolks, garlic, bell peppers, and mustard to a blender or food processor. With the motor running, slowly add the olive oil to form an emulsion. The mixture should be thick but not stiff. Season to taste with lemon, salt, pepper, and hot sauce. Store, covered, in the refrigerator for up to 3 days. My strength as a cook – and as a baker – has always been taste. Not presentation. I am good at making things that taste good but not as good at making them look good. I can put together interesting menus from a variety of sources and I can time things so a meal comes out all at once, but I am not a master of making things look as appetizing as they sometimes are. I am getting better though just through sheer practice. Sometimes I have a vision about how I want something to look and it comes out just right. Those are good moments. I have this large platter and as I was planning the menu for our summer party, I thought it would look great with several similarly sized and shaped food. I knew I wanted to make the Oven-Fried Rice Balls that I made for John and Lauren’s party back in May. 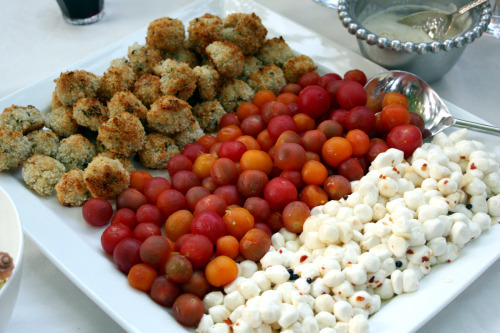 I saw a recipe for vodka marinated cherry tomatoes so then it was just a matter finding a third small ball shaped food. Marinated mozzarella was a natural choice. I wish that I could have found slightly larger balls of mozzarella – the size between these itty bitty ones and the large fist-sized balls, but I was not in a position to start driving all over town to find them. I was happy with how this looked and how everything tasted. The tomatoes were a fairly large pain in the neck as they had to be stemmed, blanched in small batches, and then peeled. As I was peeling them, I decided that they were not worth the effort. Tasting them the next day and seeing them vanish from the platter may have almost changed my mind. But not quite. I doubled this recipe for my party but kept the olive oil about the same. Place olive oil in a medium skillet and warm over medium heat. Add the garlic, peppercorns, rosemary, salt, and red pepper flakes. Remove from the heat and let cool to room temperature. Remove the rosemary sprigs. Place the mozzarella in a medium bowl and pour the oil over. Let stand at room temperature for several hours or cover and refrigerate for up to 4 days. Bring to room temperature before serving. Let’s say you’re having a party. Let’s say between 40 and 50 hungry people are coming. Let’s say you decided that you were going to make all finger food because you a) wanted to challenge yourself a bit, b) you like finger food, and c) you just can’t bear to put out Costco plastic forks for people to use only to be thrown away en masse at the end of the evening. (We can put paper plates and napkins in our yard waste containers here in Seattle.) Let’s say you needed at least one dish that was easy, looked pretty, and you knew people would gobble up. Enter tortellini skewers. This is not rocket science. You boil up storebought tortellini and skewer it with a stick. The secret here is two fold. That little leaf of basil you see tucked between each noodle adds color and a burst of flavor (this was my touch – you’re welcome, Martha.) And the sauce, which is not pictured, is one of those that taste far better than it’s components would suggest (although they are good components.) Yes, the tortellini needs to be cooked and skewered just before serving but the sauce can be made the day before, the boiling takes no brain power, and you can let your mom do the assembling. Thanks Mom! 2. Bring a large pot of salted water to boil and cook the tortellini until just tender. Drain the pasta and sprinkle with olive oil to prevent sticking. 3. 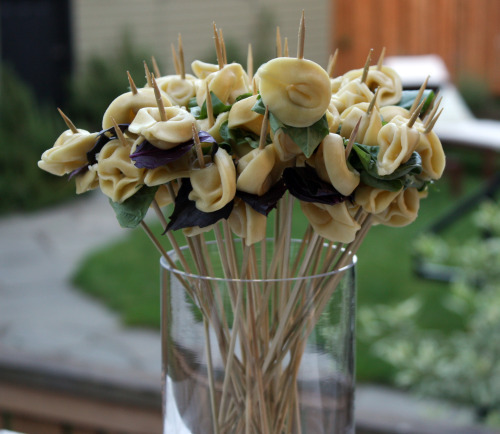 Put 2 tortellini on small, 6-inch skewers with one leaf small leaf or one large folded leaf basil. Serve with dipping sauce.